Mookie Pearl’s a mobster that has runs in with more monsters than the local drug barons and turf war killers. He’s one of the few people that know the truth about the evil that lives below the city streets. Goblins, demons, the dead and the underworld gods. Something else has come up from under the streets too, a new drug, a blue powder found within the walls of the underworld. They call it Blue Blazes and a smear on each of your temples not only gives you a brief yet intense physical boost but also gives you the ability to see the monsters that walk among us. To the normal naked eye, they may slip in between crowds unnoticed but The Blue Blazes shows them for what they really are. Mookie’s boss keeps other, smaller gangs in check and Mookie does his dirty work when necessary but when the rumour gets around that the boss is dying of lung cancer, every gangster comes out of the woodwork to make their mark. When it transpires the bosses grandson is to be given the job of running the business, the young man asks Mookie to investigate a legend. Along with the Blue Blazes, it’s rumoured that there are a number of other pigments, all with other powers. One of them is meant to restore life and this is what Mookie is asked to investigate, the last hope of saving the boy’s grandfather. Not wanting to insult the man that could become his new boss, Mookie doubtfully agrees. But only when the bosses grandson winds up dead do things get really complicated, especially as it looks like Mookie’s own daughter killed him. With superbly vivid characters, ballsy action and a ton of twists and turns Chuck Wendig hits home with another all round enjoyable novel. As a reader, you warm to Mookie and his slightly naive (or as some characters say ‘dumb’) outlook as a well-meaning monster of a man. An utter let down as a father but painfully aware of his own faults you can’t help but like him. The other creatures, especially the goblins (and what they can do with a human body) is especially gruesome and the intense violence puts it well into adult territory but these all add to the enjoyment of the read. 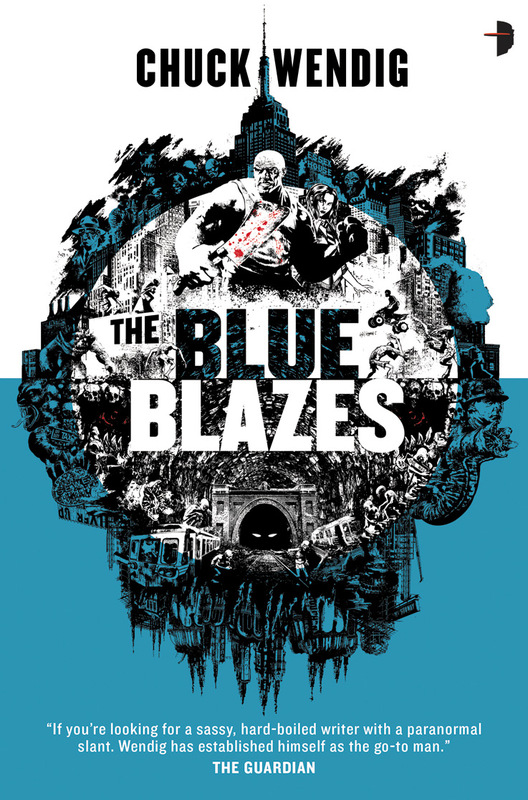 The Blue Blazes is fast, violent, imaginative and utterly addictive. Hopefully, we see more Mookie soon.